In consideration of the immense contribution being made by DTDC to the Express Industry, towards socio-economic growth of the country and its Management processes, the company has been honored with several awards. DTDC Express Ltd has been recognized as one of the Bengaluru’s ‘Hot 50 Brands’ in the 3rd edition of Bengaluru Brand Summit & Hot Brands, 2018! Organised by Paul Writer. The award ceremony was in Bengaluru on 6th February 2018.The list of Bengaluru's Hot 50 brands is arrived at after a diligent process of jury evaluation and popular voting. DTDC’s Brand Campaign TVC “Going Beyond the Parcel” has been awarded the Best Corporate Film under the category “Best Corporate Film encompassing Vision, History, Values & Spirit of Excellence” presented by the International Management Film Festival and Times Ascent at the World HRD Congress 2017. DTDC Express Limited was awarded National Award for Exemplary Position under Express/Courier category at CII Scale Awards 2016. Mr. Abhishek Chakraborty, Executive Director, DTDC Express Limited was bestowed with 'The Extraordinaire' trophy by NexBrands at its Brand Vision Summit. DTDC Express limited has been ranked as the Most Attractive Brand in India’s Most Attractive Brand 2016 by TRA Research. DTDC Supply Chain Solutions was honored with “Best E-Fulfillment Center” Award at India Cargo Awards- North & East 2016 - an all-India platform to regionally recognize the stalwarts and those behind the success of the cargo industry. Mr. Subhasish Chakraborty, CMD, has been bestowed with the prestigious title of “Doctor of Excellence” for gaining Expertise and Mastery in Field of Management by the Confederation of International Accreditation Committee (CIAC Global). He has also been conferred with a “Citation and Certificate of Excellence” for his outstanding achievements and contributions towards the community, society and the country, while meeting the strict requirements set forth by the Board of Trustees and the Governing council of CIAC Global. Mr. Subhasish Chakraborty has been awarded the FASII Award of Excellence for Business Personality of the year 2015-16 in Service Sector by General Vijay Kumar Singh, PVSM, AVSM, YSM, ADC and the Minister of State of External Affairs and Minister of state (Independent Charge) for North East Region. DTDC has been awarded the Best Franchisor Award for the 10th time in a row by Franchisee India. 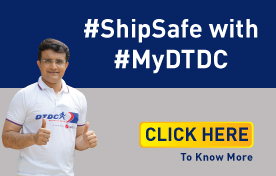 DTDC was ranked as India's Most Trusted Courier Service Brand for the third time in a row in The Brand Trust Report TM - India Study 2015 published by Trust Research Advisory. DTDC Express Limited has been awarded amongst Bangalore’s Hottest 50 Brands in 2015 presented by Paul Writers. The title of “Inspirational Leader of New India was conferred upon Mr. Subhasish Chakraborty that was jointly hosted by “I am for India” – an initiative by Hon. Smt. Latha Rajanikanth and M/s. Planman Media Pvt. Ltd...” DTDC was chosen as the Indian Power Brand of the year first in 2011 & once again in 2013 by Planman Marcom Pvt. Ltd.
DTDC was awarded the Supply Chain and Logistics Excellence (SCALE) Awards For an Exceptional Position in the Express/Courier Category by the esteemed Confederation of Indian Industries (CII). DTDC was awarded the Best eRetail Solution Provider of the Year by Franchise India at the Indian Retail and eRetail Awards which recognize the achievements of India’s successful retailers and brands across multiple categories in terms of business performance, customer experience, innovation and leadership in the retail sector. DTDC won the Best Franchisor Award in the country under the category Courier & Cargo for 9th time in 2014 by Franchising World, a part of Franchise India Holdings Ltd.
Golden Europe Global Award for Quality and Commercial Prestige 2012 was conferred upon by International Organization, "Otherways Management and Consultants" in Paris in July '12. Rashtriya Udyog Rathna Award and Quality Brands 2012 - 14 Award was conferred upon by NEHRDO and Quality Brands in June '12. DTDC was awarded The Arch of Excellence Award from AIAA (All India Achievers Association) in 2012 DTDC was awarded as one of the Top 100 CIOs of 2011 & 2012 in India & Asia, organized by the internationally renowned CIO India Chapter for implementing and mentoring open source platforms and knowledge contribution towards open source community. Subhasish Chakraborty’s won the Entrepreneur of the Year (Consumer Services) Award for 2011 by Franchise India Holdings Ltd. and Bloomberg/UTV for his continuous contribution in the field of Consumer Service. Mr. Subhasish Chakraborty was conferred upon the Golden Global Indian Award and Gold Medal for the year 2011 by Institute of Economic Studies recognizing his contributions made to the Trade, Industry and Economical Development of the country. DTDC was conferred with Best Express Distribution Service Award for the year 2011 by the reputed government organization IIMM (Indian Institute of Materials Management) in collaboration with Union Ministry of Transport & Highways selected DTDC among the industry giants for the most competitive, and bringing quality service and values to express distribution in India.